There's at least one book each year that strives to be the next big mainstream/genre crossover . . . one book that tries to achieve a sort of mainstream literary respectability, while still managing to resonate with genre fans. More often than not, those crossovers don't work, and just end up disappointing one group, while alienating the other. As such, I'm always a bit reluctant to give those books a read, but read them I do, hoping that, this time, there really is a crossover success in the making. 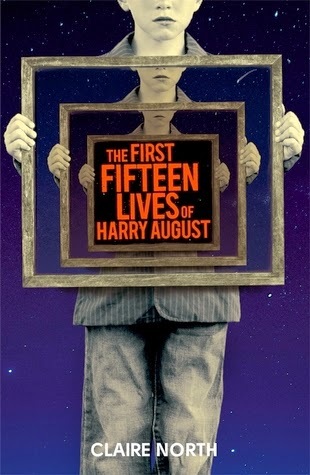 With that said, I am pleased to declare that The First Fifteen Lives of Harry August is indeed the first crossover success of the year. Whoever Claire North really is, she (or he) demonstrates a flair for literary magic here, coupled with an honest love for the genre. At its roots, this is a hard science fiction novel, one that deals with the complexities and paradoxes of time travel, as well as the intellectual and political drivers of scientific progress. In different hands it could have been dense and dry, boring to some, and bewildering to others. Fortunately, Claire North is able to easily convey such lofty concepts and explore them in a conversational manner. There is a definite 'geek' factor to the conversations between Harry and Vincent, which are often as amusing as they are fascinating, but the discussion never goes over the head of mainstream readers. It's a smart book, but one that tries very hard not to boast about its own intelligence. On the surface, this is a mainstream novel about one man's journey (okay, journeys) through life. It's a story of love, loss, triumph, sorrow. In fact, there's an almost Dickensian feel to the story of Harry's birth, his complicated parentage, and his ever-changing idea of family. For, you see, no matter how long or short his life, Harry is reborn to the same parents, in the exact same situation, every time . . . but with the memories of all his past lives. Everything else about him changes - who he loves, what he does, how he dies - but he always begins the same way. There's a sad inevitability to his life, in that no matter what he does he will always die to begin again, but there's also a wondrous sort of potential in how he chooses to live each new life. Just beneath that literary surface, nurtured by those genre roots, is the heart of the story. As we quickly learn, Harry is not alone in his cycle of rebirth and remembrance. In fact, there's a legendary/mythical Chronus Club that has arisen over the centuries to bring them all together, an informal group that's as much about playing elaborate games as it is about maintaining the temporal status quo. While members are free to dabble with possibilities and experiment with new experiences, there are key events that must be allowed to proceed as they always have before. That means no assassinating Hitler before he comes to power, no preventing JFK's assassination, and no interference in the fate of the Twin Towers. Of course, when you're talking about immortals, reborn with lifetimes of memories, it's no surprise that one or two should be tempted to break the rules . . . which brings us to Vincent. Without spoiling too much, Vincent is a man much like Harry, except he's not content with merely living one life after another. He's begun advancing technological progress across the globe, picking up where he left off with each new life, bringing progress to mankind faster and faster, with an eye towards becoming something more than just physically immortal. Burdened with the knowledge that Vincent's efforts are hastening the end of the world, bringing it closer each and every time, Harry takes it upon himself to interfere. It is their complex relationship that ultimately drives the narrative, keeping the reader engaged, and providing the true emotional and intellectual heart of the story. Here are two men who understand each other better than anybody alive, who share so many of the same hopes and dreams, and who have been friends, allies, adversaries, and mortal enemies, depending upon the life lived. It's the strength of Harry as character that keeps us engaged, and his strength as a narrator that keeps us from getting lost in the sometimes scattered recollections of his lives. Just as importantly for a book involving time travel and resurrection, there's genuine tension to the story, and honest surprises along the way. Even the final confrontation is perfect, tying up all fifteen lives in a manner that not only makes sense, but which is as ingenious as the story demands. All said, The First Fifteen Lives of Harry August is an exceptionally well-written novel, one that flows quickly and easily in spite of the lofty ideals sometimes being explored, and which offers something of substance for all readers, no matter how their shelves may lean. It's not like Cloud Atlas, is it? No, nothing like that, Alex. It's a much more linear, straightforward tale. It's more reincarnation with memories of the future than a metaphysical sort of time travel. Time travel is hit or miss for me. I think it really depends on how the concept is handled (been seeing a lot of interesting things authors are doing with that!) and the writing style. I'm not 100% sure this book will work for me just from the things I've seen about it, though from your comments it's probably a lot less abstract than I expected.